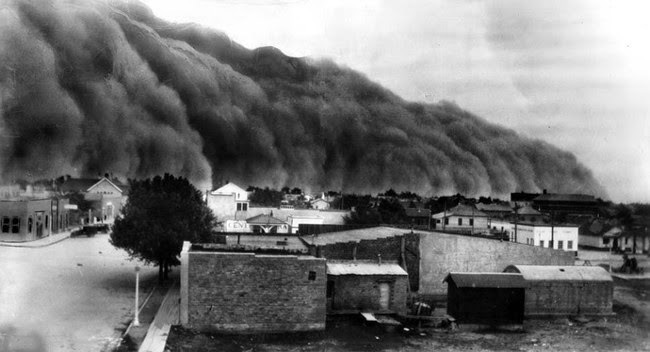 Clouds of dust enveloping entire towns was a common, if not a daily occurrence throughout the Southwest in the '30s. 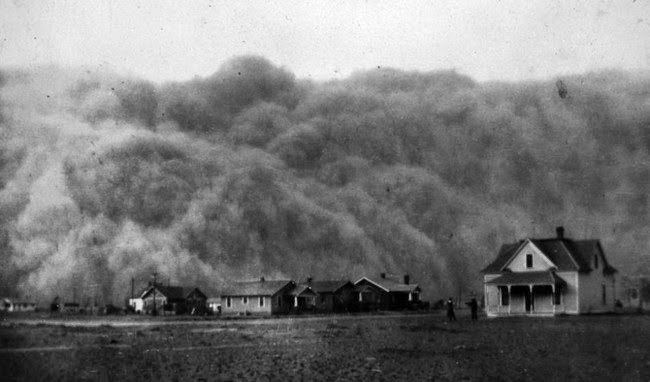 Droughts caused the topsoil, loose from overfarming, to blow away. The dust storms were so enormous that they blew across the country and affected East Coast cities, including New York and Washington, D.C. Since the farmers at the time had limited knowledge of proper farming techniques for the natural landscape, they had inadvertently been damaging their land over decades. They plowed too deeply into the topsoil, which killed off the native grasses whose long roots helped hold the soil and water in place. This looks like an immense fire, but it's dust. 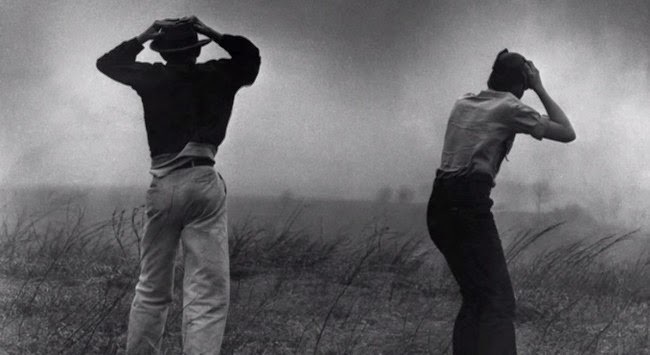 The Depression caused the price of wheat to fall, and though the government advised cutting back on production, many farmers planted even more crops. Prior to this, World War I and various other world events had caused prices to increase, and the area saw farmland multiply from 1900 to 1920. The increased areas of farmland meant less natural spaces and more potential for erosion. On top of the erosion, many cotton farmers habitually burned their fields at the end of the season, which sucked nutrients out of the soil. All of this meant that when a drought hit in 1932, the conditions were much worse than they could have been. 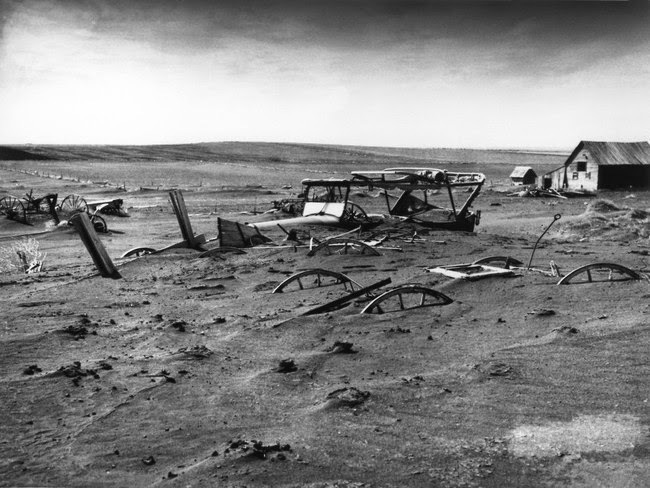 A drought would have been hard for farmers, but nothing like the decade of devastation that followed. Many people likened it to the end of the world, and some thought the end times had actually come. 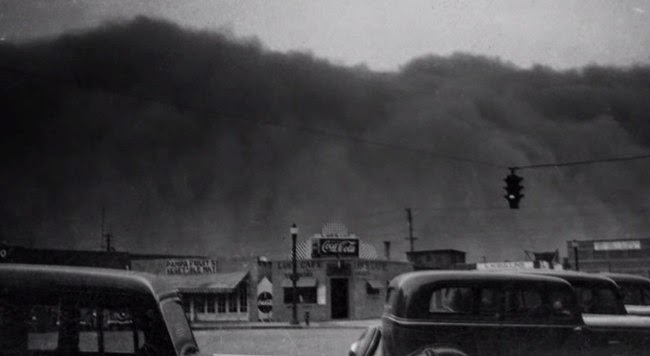 They had good reason: the natural disasters that arrived closely resembled the Biblical plagues, such as the dust blotting out the sun and making it dark at midday. Because so much of the land had been rendered barren, swarms of insects and herds of rabbits really did descend on towns in search of food, as their natural habitats provided nothing. 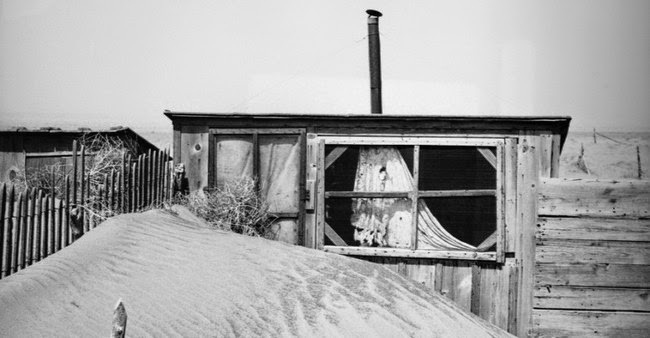 The prairies became like deserts, with drifts of dust burying buildings and cars. The states that were hit the hardest were Arkansas, Oklahoma, Missouri, Iowa, Nebraska, Kansas, Texas, Colorado, and New Mexico. This huge swath of the country provided a major amount of the population's food. 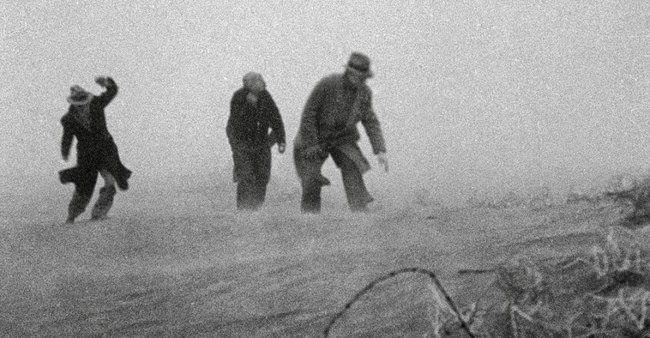 A farmer and his two young children heading into a dust storm in Oklahoma, 1936. Humans also felt the effects of the storms. With dust blowing everywhere, many fell ill and died from dust pneumonia, which causes the lungs to be so coated with dust that they cannot be cleared. Others perished from malnutrition. Oklahoma and Kansas were hit especially hard with these fatalities. 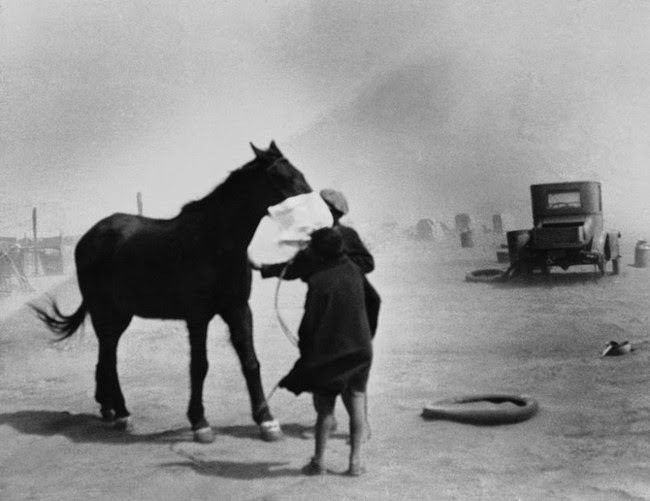 Blowing dust was so thick that everyone, including the animals, needed masks. Here, two children in eastern Colorado tie a towel over their horse's nose. 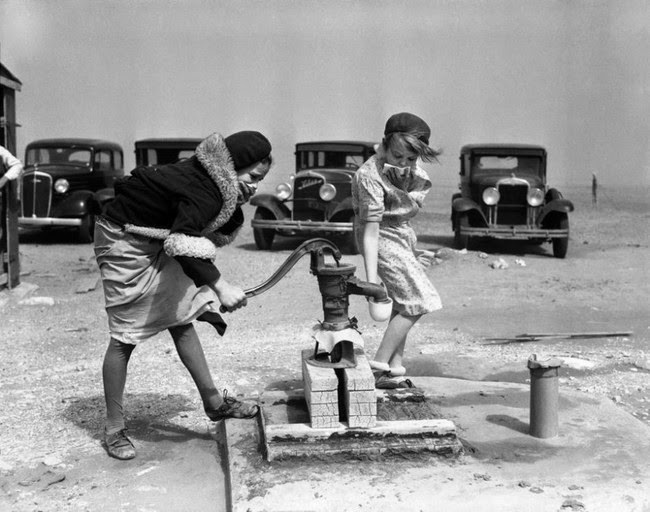 Two girls try to pump water in Colorado while holding their hands over their faces to keep from inhaling dust. With their farms and livelihoods out of commission, many families simply left. They headed west in "greener pastures" migrations, with many becoming migrant workers on California farms. To this day, this era marks the largest American migration in a short period of time, with 86,000 people moving in just one year. It wasn't just farmers who left. Business owners and other professionals who made their lives serving the farming communities also departed. Some went as far as the West Coast, while others simply moved to the next county. 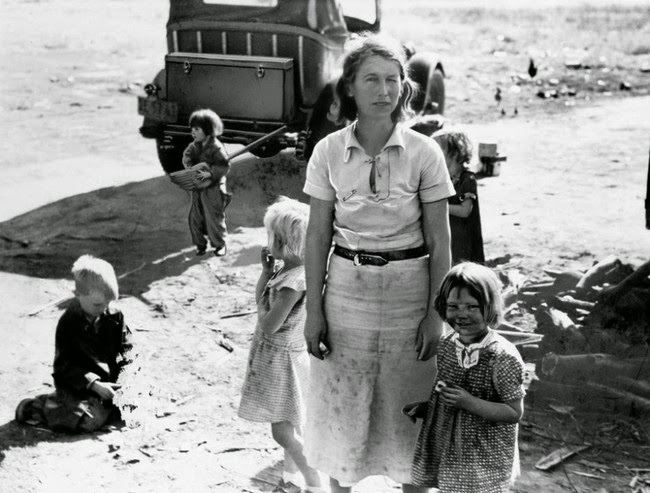 During the 1930s, there were just as many migrants in the Plains states as there were residents. This lonely house was one of the last homes still occupied in this region of Texas. Most families had left by this time. 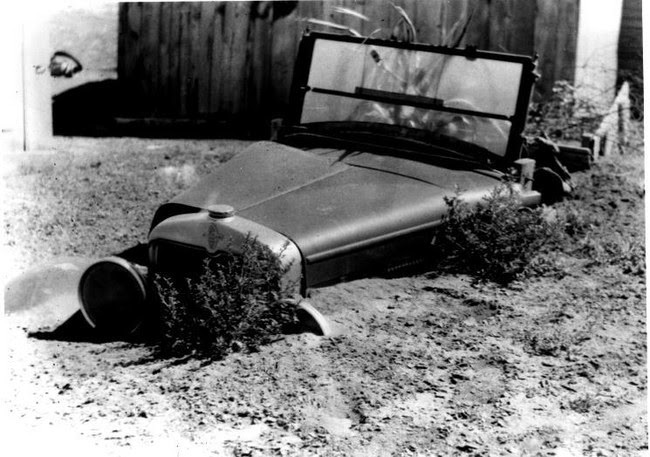 In response to this situation, President Roosevelt initiated a number of soil conservancy programs to get the ecology balanced again. Food and clothing were distributed to the needy. 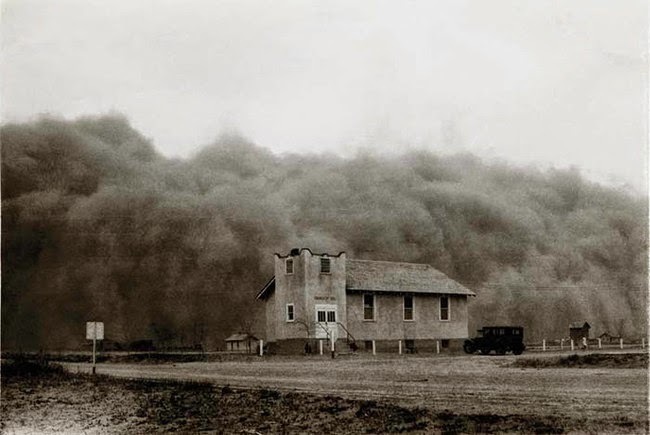 By the late 1930s, after using better farming techniques, farmers got soil erosion to drop by nearly 65%. Huge belts of trees were also planted to stop winds and retain water and soil. 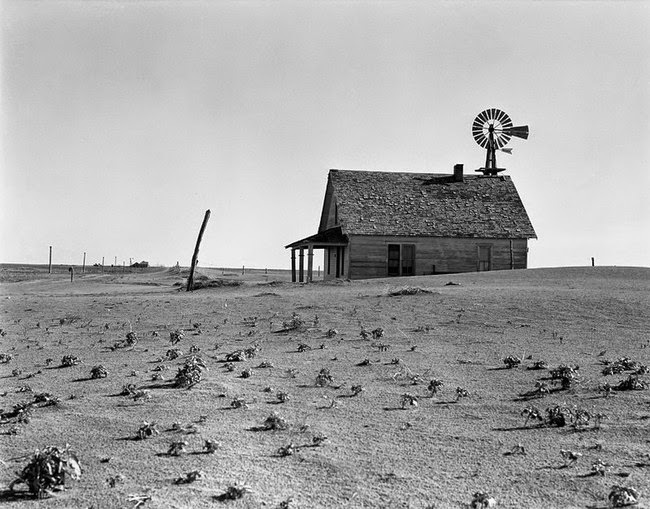 The drought ended in 1939 with a return of regular rain, but the land had been seriously depleted. Worst of all, many farmers went right back to using unsustainable farming methods. 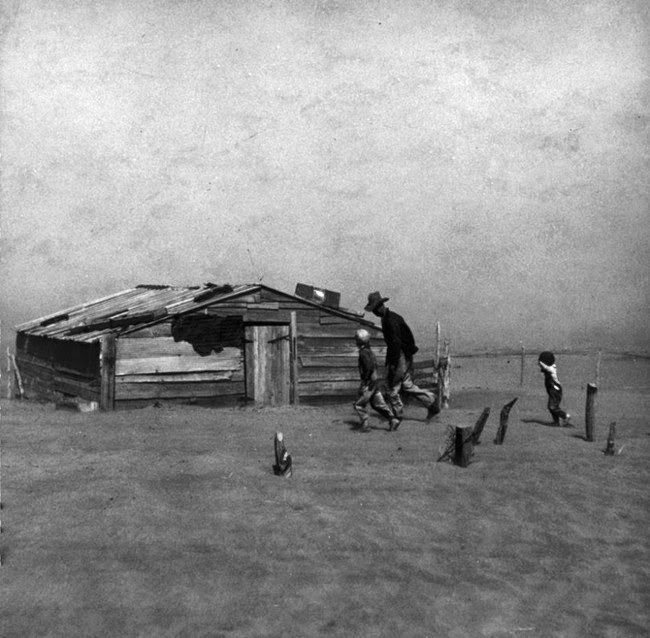 The devastation was so immense that images of it, as well as snippets of interviews with survivors, were used in the 2014 film Interstellar, which deals with a worldwide Dust Bowl-like scenario. 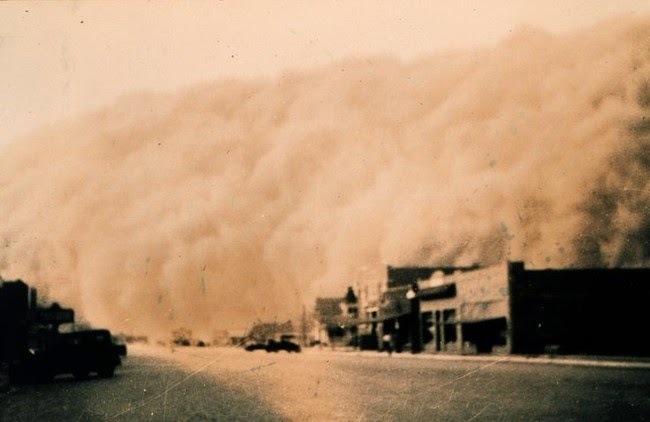 A dust storm in Stratford, Texas, in April 1935. Today, there is still concern over whether or not food production is sustainable. Our farming technology is new, but there are doubts about what it could be doing to the land, both locally and globally, as well as its impact on human health. 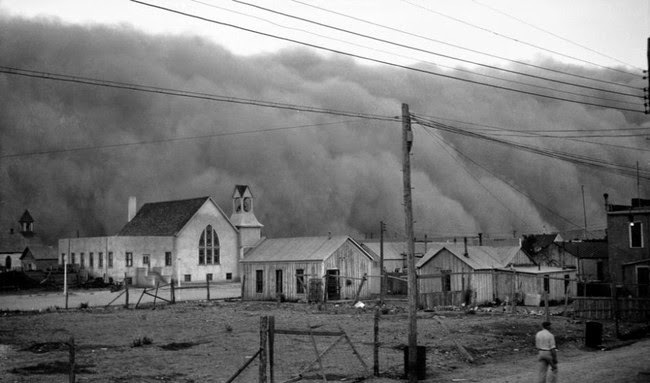 The country eventually bounced back from the Dust Bowl, but we hope something like this doesn't have to happen again to make us more careful.